On June 26, 1823, a fine summer day, a strange wanderer arrived at the Tibetan Lamaist Monastery of Zangla, situated in the Himalayas 3500 meters up, and far from the routes used by tradesmen and pilgrims. He had come from Leh, the capital of Western Tibet or Ladakh, and had a few lines of introduction from the khalon, the Minister of the royal court. The letter said that he was going to study Tibetan in the monastery. His name was Skander Beg, but in spite of his Armenian name, clothes and looks, he was quite clearly something else. The Armenians arrived there with the purpose of trading but this guest wanted something completely different. There was something strange about his face, too, but only the lama who received him, Sangye Puntsog, knew what it was. He was a European. The first, the very first one to reach that place. The other monks in the monastery did not even know what Europe was; but Sangye Puntsog knew. He visited the royal court on occasion arid had already met Europeans there. He had also met the "great lord" William Moorcroft, the patron of the newcomer. He also knew that the Europeans ruled most of India; they had arrived not so long ago, they were few in number, and yet had power over the native Indians. They ruled those whom the Tibetans had looked upon with respect throughout their whole history. The Europeans' empire already bordered on Ladakh; the frontier ran some 3-400 kilometres south of the Monastery of Zangla, along the bank of the Elephant River, the Langchen-chu, which the Europeans called Sutlej. Nobody knew what they really wanted, and what plans they had for Ladakh where the Tibetans lived. So Sangye Puntsog was expecting the newcomer. He had been told at the court that for the sake of fostering good relations he would have to heed the strange request, and that the European would pay him for his pains. The guest who arrived from Leh after a walk of nine days was none other than the Hungarian Alexander Csoma de Koros. He had not left his country several thousand kilometres away to get to the Monastery of Zangla; he had not even known that the Tibetans existed. He had" taken to the road for other reasons, and it was only the caprice of fate that had led him to Tibet where, again by accident, he had met that certain Moorcroft who persuaded him to learn the Tibetan" language, unknown to the educated world, and to compile a dictionary and a grammar. This would hardly, he argued, present much of a difficulty to a man who had already learnt fourteen languages, and could just as well add one more. Csoma gave in, and planned to devote a year to this task which he found interesting enough. It was Moorcroft who had told him of Sangye Puntsog, and had recommended that he be his teacher. At their first meeting, Csoma was 39 years old and the Lama was 50. One of them was an outstanding European scholar, the other an excellent representative of Lamaist culture. The sons of two different worlds, and both reserved by nature to boot. It took them a long time to get to know each other, but their acquaintance developed into mutual respect. The Lama learnt that not every European was necessarily an Englishman and that not Every European necessarily represented political power. There were Hungarians among them as well, and scientists. Csoma, for his part, learnt that not all lamas were alike; few among them were truly broad-minded, and, among the cultured ones, even fewer were open and. capable of teaching an adult who had come from a completely unknown world. As for the Tibetan language and its literature Csoma found it to be infinitely more valuable than he ever imagined. That is how joint work started on what turned out to be a milestone in scholarship: on making the treasures of Tibetan culture accessible to all. This crucial question raised by the dictionary of Korosi in my boyhood continues to linger on for seven decades. The format of Korosi in its uncomplicated presentation invites questions of linguistic development that evade us in consulting the sophisticated apparatus of Jaschke or Sarat Chandra Das or the modern Tibetan and Chinese dictionaries. Reading, not only consulting, Korosi has been a stimulation, an inspiration, a catalyst for new ideas for me. The 1984 edition of the Collected Works of Alexander Csoma de Koros is my companion to browse through unchartered terrains of language. Just as Ra.sa 'the land of goats' became Lha.sa 'the land of gods' when the Yarlung dynasty shifted its metropolis from the Yarlung Valley to the more central Lhasa, likewise Tibetan orthography is to go down to the cellar to dream, to lose oneself in the distant corridors of etymology. The elemental material in Korosi's dictionary is to descend into treasures of thought vis-a-vis language. Korosi opened up the ancient libraries to carry us away into the antecedence of being, into a beyond of dreams. The journey commenced by K6rosi in bringing Tibetan close to the West by his dictionary, now finds its powerful culmination in the dynamised centre that Tibetan Buddhism is fast becoming in the West Korosi's dictionary began the irradiation of the light sleeping on unknown horizons. By the herculean efforts of K6rosi and his compatriot successor scholars like Sir Aurel Stein, Hungary has emerged as a land glowing with discoveries of the vigour of India's cultural history. 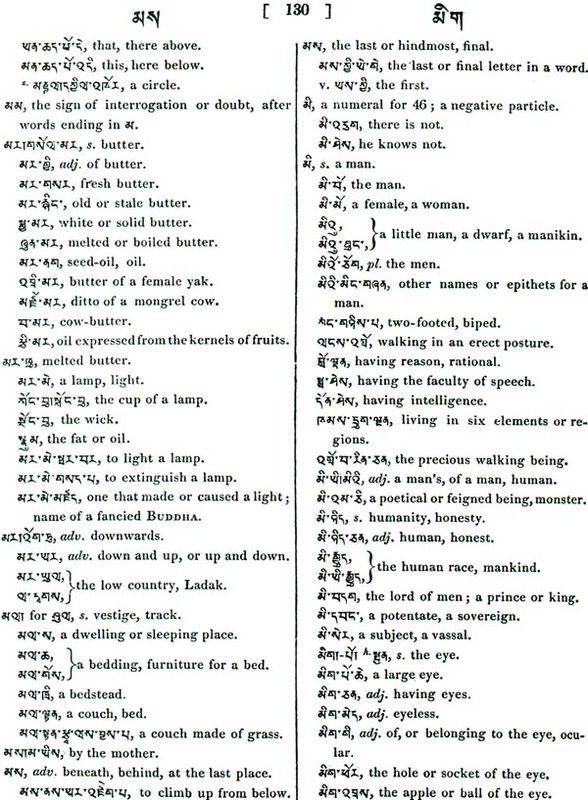 The Tibetan Dictionary, now presented to the learned world, is indebted for its appearance to the liberality and patronage of the British Indian Government, with which the author of this work, during his Tibetan studies, has been favoured, under the administration of two successive Governors General of India, Lord Amherst and Lord William Cavendish Bentinck. It is with profound respect that be offers his performance as a small tribute of his grateful acknowledgment for the support he has enjoyed, and particularly for the resolution of the Government in the beginning of the last year-sanctioning the publication of the Grammar and Dictionary at the public expense. Since by this means the elementary works, absolutely necessary for a funda, mental knowledge of the Tibetan language, have been secured for such as shall interest themselves hereafter in acquiring a knowledge of the literature of Tibet. Besides the general patronage by the British Government, the author acknowledges himself to have been obliged by the liberal assistance and kindness of several gentlemen of the same nation, to whom he publicly returns herewith his respectful thanks for the favours conferred on him. And he begs to inform (he public, that he had not been sent by any Government to gather political information; neither can he be accounted of the number of those wealthy European gentlemen who travel at their own expense for their pleasure and curiosity; but rather only a poor student, who was very desirous to see the different countries of Asia, as the 'Scene of so many memorable transactions of former ages; to observe the. manners of several people, and to learn their languages, of which, he hopes, the world may see hereafter the results; and such a man was he who, during his peregrination, depended for his subsistence on the benevolence of others. He has been particularly indebted to the attentions of Messieurs Henry and George Willock, as also of Mr. Richard, the Surgeon to the British Embassy, when at Teheran, in Persia; to the late Mr. W. Moorcroft, and his companions, Mr. George Trebeck and Meer Izzet Ullah, when ill Ladak and Cashmir, and to Captain (now Major) C. P. Kennedy and Dr. J. Gerard, at Subathu. Upon the first he depended for protection, and pecuniary assistance from Government, during his studies in Tibet and in Knaor, or Upper Besar, and who has kindly reported his communications to Government ; while Dr. Gerard assisted him with several useful books. After his arrival at Calcutta, he was placed under obligations to Mr. H. H. Wilson, late Secretary to the Asiatic Society, (now Professor of Sanskrit at the University of Oxford,) for the trouble which Mr. Wilson took in making extracts of his papers on the Tibetan literature, and publishing them. Lastly, he gratefully acknowledges the favours which Mr. J. Prinsep, present Secretary to the Asiatic Society, continues to confer on him, in correcting and smoothing the English part of his works during their progress through the press. Besides the British assistance thus afforded, he thankfully acknowledges the kind and generous treatment he met with, during his peregrination, from two French officers, Messieurs Allard and Ventura, now of high rank, in the service of the Maha Raja Renjit Sing, at Lahore ; from Mr. Ignatz Pohle, a Merchant of Bohemiav at Aleppo; and upon his kind recommendation, from his agent at Bagdad, Mr. Anton Swoboda, of Hungary; from Mr. Bellino of Vienna Secretary to the late Mr. Rich, Resident at Bagdad (then in Curdistan), And lastly, from a good-hearted man, Jos. Schafer, of Tyrol, a Smith by profession, at Alexandria; in Egypt. The foregoing is a public and grateful avowal of the favours and good services conferred on the author, Now of the work itself. Though the study of the Tibetan language did not form part of the original plan of the author, but was only suggested after he had 'been by Providence led into Tibet, and had enjoyed an opportunity, by the liberal assistance of the late Mr. Moorcroft, to learn of what sort and origin the Tibetan literature was, he cheerfully engaged in the acquirement of more authentic information upon. the same, hoping, that it might serve him as a vehicle to his immediate purpose; namely, his researches 'respecting the origin and language of the Hungarians. The result of his investigation has been that the literature of Tibet is entirely of Indian origin. The immense volumes, on different, branches of science, &c. being exact or faithful translations from Sanscrit works, taken from Bengal, Magadha, Gangetic or Central India, Cashmir, and Nepal, commencing in the seventh century after Christ. And that many of these works have been translated (mostly from Tibetan) into the Mongol, Mantchou, and the Chinese languages; so that, by this means, the Tibetan became, in Chinese Tartary the language of the learned, as the Latin in Europe. 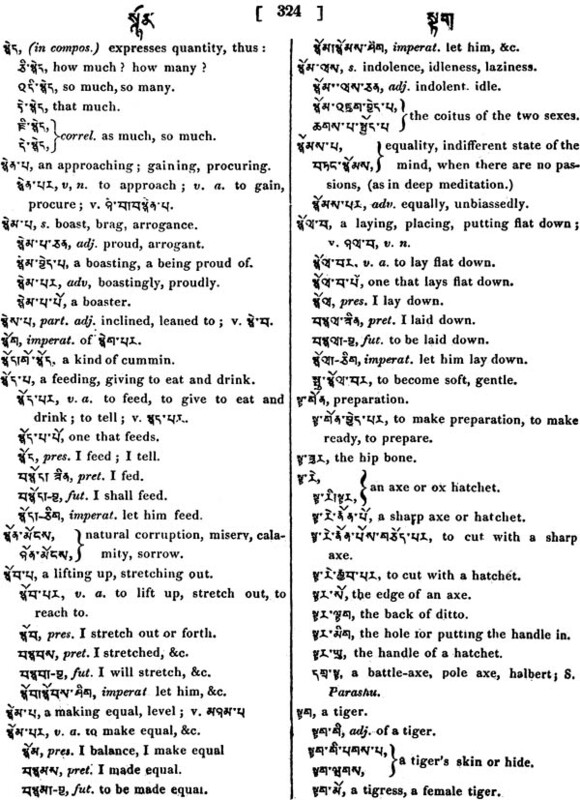 After thus being familiarised with the terminology, spirit, and general contents of the Buddhistic works in Tibetan translations, the author of this Dictionary estimates himself happy in having thus found an easy access to the whole Sanscrit literature, which of late has become so favorite a study of the whole learned Europe. To his own nation he feels a pride in announcing, that the study of the Sanscrit will be more satisfactory, than to any other people in Europe. 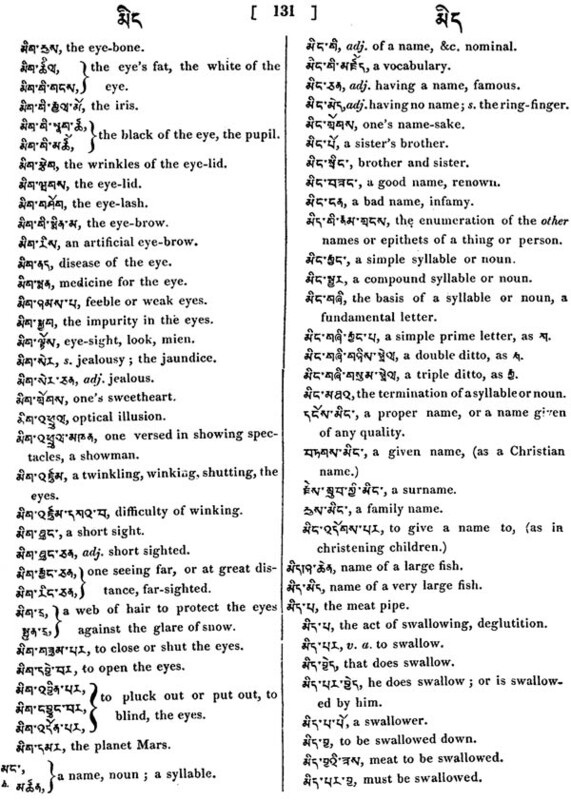 The Hungarians will find a fund of information from its study, respecting their origin, manners, customs, and language; since the structure of the Sanscrit (as also of other Indian dialects) is most analogous te-the Hungarian, while it greatly differs from that of the languages of occidental Europe. As an example of this close analogy ;-in the Hungarian language, instead of prepositions, postpositions are invariably used, except with the personal pronouns; again, from a verbal root, without the aid of any auxiliary verb, and by a simple syllabic addition, the several kinds of verbs, distinguished as active, passive, causal, desiderative, frequentative, reciprocal, &co are formed in the Hungarian, in the same manner as in the Sanscrit and in neither of them is the auxiliary verb" to have" required for the formation of the preterite and other tenses, as in the languages in general of western Europe. But this is not the place to pursue an inquiry, in which the author, from patriotic as well as philological predilections, feels necessarily the deepest interest. With respect to the Dictionary (as well as to the Grammar, by which it will soon be accompanied,) now published through the liberality of this Government, the author begs to inform the public that it has been compiled from authentic sources, after he himself became sufficiently acquainted with the language, with the assistance of an intelligent LAMA, (whose name is respectfully mentioned on the title-page.) in whose intellectual powers the author had full confidence, and whom he found to be thoroughly versed in Buddhistic literature in general, well acquainted with the customs and manners of his nation, and possessed of a general knowledge of those branches of science that are more essential for t he preparation of a Dictionary. In every respect qualified as a gentleman, to mix and converse daily with the first men of his country, having also visited the greatest part of Tibet, he knew very well the respectful terms, (marked in this Dictionary by the meaning honorific or respectful.) the multiplied use of which is a peculiarity in the language of Tibet. Such terms, though they strictly belong to the Tibetan language, constitute a sort of poetical dialect: they occur frequently in the literary works, as also in the conversation of the educated classes, especially among the nobility. Sanscrit terms seldom occur in their books, with the exception of a few proper names of men, places, precious stones, flowers, plants, &c., where the translators could not determine what their proper signification would be in Tibetan. 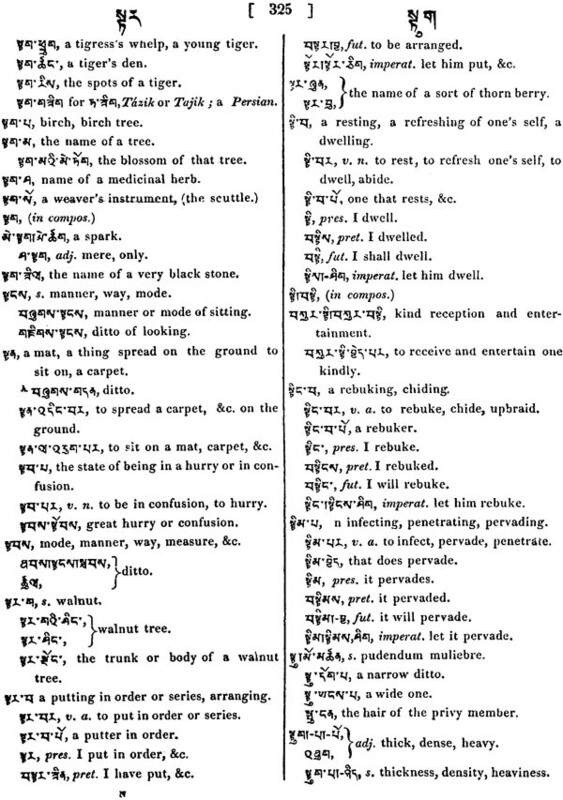 But the technical terms, in arts and sciences, found in Sanscrit, have been rendered (not as European nations have done with their translations out of Greek and Latin) by their precise syllabic equivalents in Tibetan, according to a system framed expressly for the purpose by the Pandits who engaged in the translation of the sacred works of the Buddhists into the latter language; as may be seen in the several vocabularies extant of Sanscrit and Tibetan terms, ;of which a large one has been translated into English by the author of this Dictionary, and presented to the Asiatic Society; the same, he afterwards found, had been previously made known to the learned of Europe by the late Mons. Abel Remusat. The scheme prefixed to the Dictionary will give a general idea, (in the absence of the Grammar) how to read the Tibetan words. The structure of the language is very simple. There is one general form for all sort of declinable words. In the verbs, there is no variation with respect to person or number; the noun or pronoun, in the singular or plural, showing how the sense of the verb must be taken. When the student is acquainted with the auxiliary verbs, and particles for forming the different moods and tenses, he can conjugate every verb. There are some irregular verbs, of which it is required previously to know the present, preterite, and future tenses, and the imperative, but these are mostly a sort of compound verbs: they have been explained in the Grammar, and introduced, at their respective places, in the Dictionary. In the whole of Tibetan uniform orthography is observed, but the orthoepy differs according to different and distant provinces, especially with respect to the compound consonants.